Ready to send to the students when school is back in the swing of things and Canberra Camp is over. What do you think? 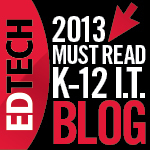 For teachers reading this, you may have already read something about blogging 7000 times on the Internet. Forgive me. Kids, this is for you. Why do YOU write? Is it because you HAVE to? Is it because your teacher has to have a piece of writing by the end of the week so they can do your reports? Maybe it’s to show your teacher that you understand a topic. That’s a good reason. Sometimes you write to inform other children in the class about a topic you have researched. Another good reason. There are probably LOTS of reasons why we HAVE to write – we go to school! Now put your hands up if you write because you WANT to. (pause to allow time for children to raise their hands before reading on). If you didn’t put your hand up, that’s OK. No doubt, you’re not alone there. I don’t always want to write. I think sometimes we don’t want to write because we see no purpose to it. ( Before we go any further, just want to remind you that at school, you still HAVE to write, OK? I am still a teacher after all.) Anyway, my point is I think a lot more of you would WANT to write if we could give you some good reasons to write. That’s why I want to talk to you about blogging. Perhaps you don’t know what blogging is. Blogging is a writing publishing platform on the Internet that allows ANYONE to get their message across to the world. In other words, it gives you a world wide audience. You can share words, pictures, videos, animations, quizzes, polls – anything – and find out what other people think. There are obviously lots of rules we need to go through before we start this blogging thing but we’ll go through those later. Let’s just get back to blogging. Here are my reasons why I think you should consider blogging. Audience. Blogging means people other than your teacher, a couple of classmates in a conference and your parents when your file book comes home at the end of the term, get to see what you have to say. Think about that. A reason to write because others WANT to read it. A reason to write about your passions and interests that your teacher and Mum might not find interesting but 100s of children around the world find fascinating. Sharing your knowledge. Guess what? You know stuff. It’s hard to let everyone know that sometimes when you have to stick to topics in class. When do you ever get the chance to share your knowledge of African capital cities? ( OK, Mr G, this isn’t about you, move on.) Or, your skills in playing a sport, your expertise in making animations? Blogging let’s you share this knowledge with others interested in the same thing. People learn from you and in return you may learn something you didn’t know. Since I’ve become interested in blogging I have learnt so much about Web tools, teaching methods, Maths and iPad ( yes, that’s right – I’ve learnt something from others about Maths and iPads. Shocking!) I’ve taught others too through my blog. It’s a nice feeling. And I want to keep doing it. Reflective thinking. “OK, so this is starting to sound like school work now, not writing because I want to.” I hear you say. But hear me out on this one. Seriously, you should WANT to think. It helps you learn and improve. Writing a blog gives you a chance to write down your thoughts. Spending the holidays starting my blog on iPads in Schools has really enabled me to clearly think through what I really believe. Without writing the blog, I would not have a clear plan in my head. I would not have come up with half the ideas if I hadn’t spent the time thinking and writing. Give reflective thinking a go. After a Maths class, spend some time writing about what you just went through. It will help, trust me. Feedback and collaboration. At school, you get, at best, one chance a week to get some real feedback about your writing and thinking. If you’re lucky, your teacher will give you advice and 3 or 4 classmates in a conference might as well. On a blog, your writing is there for everyone to comment on. Your teacher, your friends, your family, a scientist from Germany, a sports coach from Brazil. Who knows? If it’s good, they’ll tell you why. If it needs work, a random student from the UK is more likely to give you honest feedback than your best friend will. 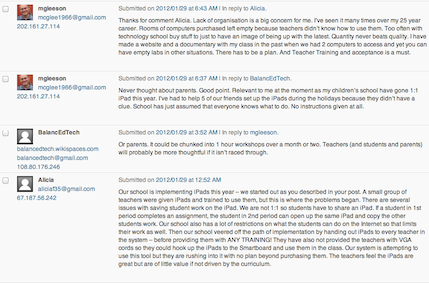 Maybe other teachers from around the world will give you added feedback to support your teacher’s advice. It happens. You can also start up shared projects through your blog. It really can be a great opportunity if you want it to be. It helps you feel good. Sometimes there has to be selfish reasons too. I have to be honest. I got a huge ego boost this week when I saw my blog appear on Google Search, Scoop-it and Zite Magazine’s Top Stories section on my iPad. 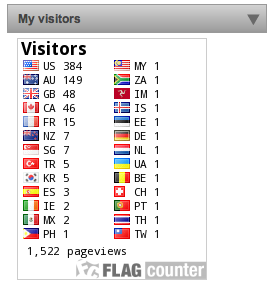 Watching 33 countries’ flags appear on my blog and seeing the views counter tick over from 800 to 1400 overnight gave me a buzz. It’s a far better feeling than seeing your writing sitting on your teacher’s desk for a week or waiting 5 days for a response to an email you send to your colleagues. Knowing that other people want to read your work inspires you to want to do more. Especially when they tell you. So go ahead, kids. Do it for the attention… But do it well or you’ll lose your audience. There are a lot more reasons for blogging than this but it’s a start. Of course we can’t do anything without the go ahead from school. There are a lot of rules and permissions and other important necessary stuff to go through before we can get started. You can get it going, though, if you tell us you really want to do it. So I ask you – do you want blog? There are massive numbers of kids out there on the Internet doing it right now. If you want to join them, let us know and we’ll see what we can get started.